The Detroit Symphony Orchestra will be performing works by Georges Bizet Friday morning. You might enjoy classical music and like to attend the performance, but live far away from America’s Motor City. On Saturday, the GoGo group Curtis Johnson & The Band Eternity is performing at the Kennedy Center in Washington, D.C. If you live overseas, going to that show is probably out of the question. But there is a solution! These and other concerts are available “live” on the Internet. You can hear them in real time with an electronic device. Both performances will be available on the World Wide Web. They are part of a growing number of concerts broadcast on computers, tablets and smart phones. These digital concerts are known as live-streaming. Technology expert Michael Antonoff says better and less costly equipment is making it easier for performers and theaters to offer music "live" online. The quality of the sound and video images are improving all the time, he says. A few years ago, the Detroit Symphony Orchestra experienced hard times, similar to its home city’s financial problems. The orchestra even had to cancel its 2010-2011 season because of a bitter labor dispute. After the dispute ended, the group started offering concerts online. Those online concerts now have as many as 40,000 viewers per show. People in 100 nations are watching. “It is a huge part of our increasing global reach,” said Eric Woodhams, director of digital initiatives at the Detroit Symphony. He said it also increases donations to the orchestra. Some concerts are done from fine arts centers. The Kennedy Center has been offering live webcasts of its daily, free 6 o’clock concerts since 1999. 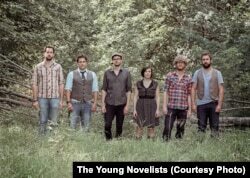 The Toronto-based Young Novelists' music is available via live online concerts. Other performers sing from their living rooms, using a small camera or two and several microphones to capture their songs. But it does take some getting used to, especially the lack of a live audience. People show their appreciation by leaving comments in the space provided. Many livestream concerts charge between $2 and $10 to watch. Many are free or let people choose how much to pay. People can add “tips” for the performers – much like someone might leave extra money for a server at a restaurant. On New Year’s Eve, many people at Washington’s Kennedy Center were dancing to the modern jazz tunes of Michael Mwenso & the Shakes. Mwenso urged people watching at home to join in the dancing. But performers cannot see whether their online followers are dancing, cheering or falling asleep. For international performers, Kennedy Center officials see a jump in online viewership from the home countries of the performer. There is hometown pride when an artist is performing at one of America’s best-known concert venues, says the Kennedy Center’s Garth Ross. At a recent Kennedy Center concert, a performer said he was so happy that his disabled mother back in California could watch his performance. It is not just music being streamed on the web. On December 10, the producer of the musical “Daddy Long Legs” put the show on the web free of charge. It was the first live webcast of a New York musical. Over 150,000 people from 135 nations watched, producer Ken Davenport said. Popular sites streaming live concerts and other events include: https://www.stageit.com, https://www.concertwindow.com and http://livestream.com. Who would you like to see perform online? Have you ever watched an online concert and, if you did, what did you think?​ Write to us in the Comments section or share your views on our Facebook Page.